The natural warmth and beauty of a wood fireplace creates a striking focal point in any room. Wood fire surrounds are hugely popular as they are available in a range of finishes and styles making them the perfect addition to any home. A period home may require a very different fireplace to a new-build and, with this in mind, we offer a range of designs. When combined with a marble hearth, a wooden fireplace is a classic and elegant feature and creates a warm, welcoming atmosphere. For a modern twist on a traditional design, a contemporary wooden fireplace featuring cast iron inserts is the perfect way to update the decor of your period home with a nod to the past. In modern homes, a wooden fireplace with sparkling granite panels adds warmth and character to a room, without compromising on style. Most wood fireplaces are made from solid wood, meaning they are not only attractive to look at, but are also durable and of excellent quality. From the splendour of a traditional oak fireplace to the more contemporary appeal of pine, solid wood is as popular as ever. 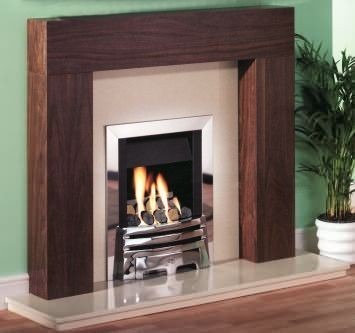 Solid wood never goes out of fashion so you don\'t need to worry about your fireplace dating. An alternative to solid wood is a fireplace made from MDF and finished with real wood veneers for a luxurious appearance on a budget. From classic traditional designs, to more contemporary surrounds, there is a wood fireplace to suit everyone. No matter what your style, budget or taste, a wood fireplace is the timeless choice for your home.